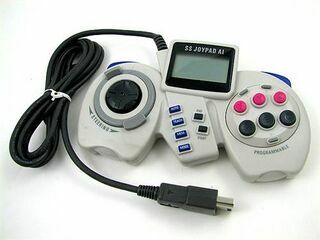 The SS JoyPad AI is a third-party controller for the Sega Saturn. The Japanese version credits Intec as its creators, although elsewhere it was marketed as the SS Majoris AI, with credits going to Game Source/Eternal Peace Electronics. At present its true origins are unknown. The SS JoyPad AI is an upgrade over the SS JoyPad DX, with added programming abilities.